for $449,900 with 5 bedrooms and 3 full baths. This 4,185 square foot home was built in 1984 on a lot size of 8.7100 Acre(s). 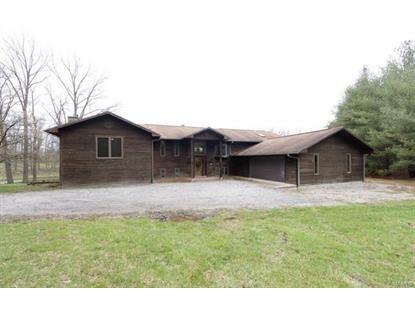 This Property is located on two parcels: 16-13.0-300-019/020 for over 13 wooded acres with a lake. Home is a one of a kind! As you walk in to this beautiful home you will notice a wall of windows that overlooks the lake. In the 2-story Living Room there is a floor to ceiling stone fireplace that opens to the kitchen, Den and the Loft. On the other end of the house is a large family room with Fireplace. Off the kitchen there is a spacious sunroom with built-in brick grill. The Large Master suite has trey ceiling, plenty of closet space and a deck that overlooks the lake. There are 4 additional bedrooms some with private decks. Home is located just a few miles from Waterloo, Millstadt and Smithton. This is a Fannie Mae Property. Buyer to verify all MLS data including but not limited to sq feet, measurements, features, exemptions/taxes, schools, etc.